Why We Are Losing Americans To Prescription Medications? More Americans are consistently taking prescription drugs than ever before. The debate goes on about why. Some cite increases in health concerns, others indicate medical professionals are responsible, and some point to “big pharma” pushing pills. What is clear is the need for change. 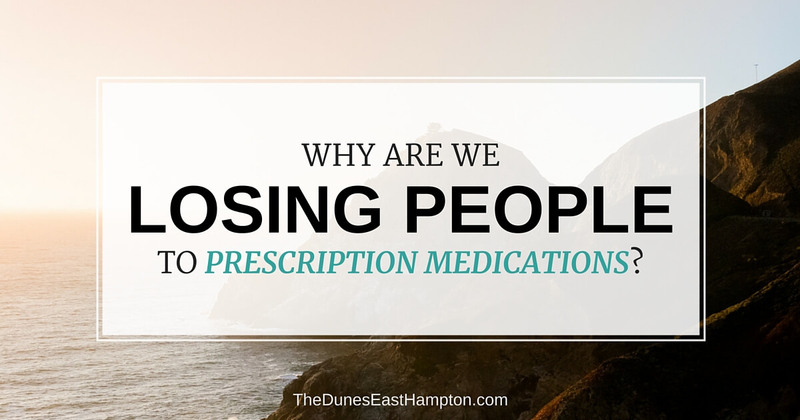 An average of three out of every five adults are on prescription medications every year. At a time when these cause more deaths than car accidents, this is worth close examination. In 2014, The National Institute on Drug Abuse reported that 25,760 people lost their lives to prescription drugs that year. This marks a nearly three-fold increase in just 13 years. Of these deaths, 6,867 were the caused by either anti-depressants, barbiturates or benzodiazepines. The overwhelming majority were related to the use of opioid pain relievers – which were involved in deaths 3.4 times more than they were in 2001. Prescription drug-induced fatalities are most often associated with two major categories of medication – opioid pain relievers and mood stabilizers. Benzodiazepines are a good classification to use as an example. These are frequently prescribed to treat anxiety and insomnia. Klonopin, Ativan, Valium and Xanax are some of the most common medications doctors prescribe. All of these substances enhance the efficacy of neurotransmitter gamma-aminobutyric acid, which lowers the activity of stress- or anxiety-inducing neurons in the brain. Of course, these symptoms alone can cause secondary injury or death. With their current link to the onset of dementia, some question whether the side-effects are worth the benefits when prescribing benzodiazepines. The Centers for Disease Control and Prevention (CDC) reports that more than 50 percent of opioid-related deaths are tied to prescription use. Methadone, oxycodone and hydrocodone are the most common culprits. These work by hindering opioid receptors in the brain, blocking pain signals. People with chronic pain are given temporary relief by taking these medications, but, unfortunately, can quickly become addicted. Side effects of short-term use include nausea, vomiting, dizziness and constipation. Somewhat disturbingly, long-term opioid use is also tied to immunosuppression – when a person’s immune system shuts down. This can cause far-reaching health problems, even after discontinuing opioid use. In 2013, 207 million prescriptions were written for opioid pain relievers – a dramatic increase from the 76 million written in 1991. The United States is by far the largest consumer of these medications, occupying 80 to 100 percent of the market. With more scripts being written every year, and serious complications ensuing, are consumers being properly educated about the ill-effects of these medications? Between 2000 and 2012, the percentage of Americans taking five or more prescription drugs at a time nearly doubled – from 8 to 15 percent, representing an overwhelming 47.1 million citizens. Numbers like these mean it’s not only common for Americans to be on one prescription drug, but it’s not uncommon to find somebody who been prescribed multiple medications. The combination of the two aforementioned types of medication, benzodiazepines and opioids, is a perfect example of potentially fatal interactions – when one drug “interacts” or interferes with another. Though different methods, both depress the central nervous system. In an immediate sense, this increases affiliated side-effects. Internally, opioid and benzodiazepine medications work against one another. Studies have shown that they inhibit the body’s ability to process the other. In test subjects, liver and brain tissues both retained unusually elevated levels of these chemicals for extended periods of time when combined. Even patients following their doctor’s orders are at a high risk for complications when taking these two medications in conjunction. One of these medications is a pain reliever and the other a mood stabilizer. It is therefore possible that patients are getting them from different specialists. It should be the responsibility of all providers to educate their patients about all potential interactions. It is impossible to thoroughly address prescription-driven deaths without discussing addiction. This is an ever-growing problem as the number of pills dispensed grows. Though Americans have not reported an increase in pain levels, the number of scripts written has nearly quadrupled since the late-1990s. Placing large quantities of highly addictive substances in people’s hands paves a clear path to the epidemic in which the country now finds itself. Taking medication as directed does not necessarily protect one against addiction. For patients who are undergoing long-term treatment, this presents real concerns. The effect opioids have on the brain addresses pain, but it also creates abnormalities that lead to dependence. When patients attempt to reduce or stop their use without a proper detox period, they could become worse before they are better. Recent studies suggest people who suffer from opioid dependence are 40 times more likely to transition to heroin – a chilling fact. And others studies back it up, as death from heroin is steadily increasing. Two primary reasons seem to account for this shift. First, patients who become addicted to opioid pain relievers often report that the substance’s effects diminish over time, compelling users to seek stronger drugs elsewhere to cover pain. Another contributing factor to this rise in heroin use is availability. When a doctor can longer prescribe the opioid, then the user, who is likely going through withdrawal, will find another option. Usually, that option is heroin, which is cheaper and more readily accessible than prescription pills. Heroin, once thought of as a street drug, now crosses all social classes, incomes and ethnicities. With so much at stake, why is the prescription drug culture still on the rise? Experts disagree on why Americans have landed in this prescription-obsessed mentality. Some speak to the ever-increasing levels of stress the average citizen experiences. Studies indicate the number of people working more than 50 hours per week, without enforced weekly time off, paid maternity leave or paid annual leave, has skyrocketed. At the same time, household incomes are not rising. Fear of job loss is enough to tie people to jobs that are detrimental to their mental well-being. The digital transformation is also a likely culprit. People feel constantly connected – and they can’t lose that connection for downtime. Americans have virtual meetings, cellphones, landlines, tablets, laptops and an array of smart devices. In some cases, this increases the desire for instant gratification and decreases an individual’s ability to find a quiet space. For others, it leads to a hyper-diligence that makes it difficult to break away. Regardless of the reason, some people have found relief in drug use, and it has turned into addiction. This paints a picture of a society ripe for a pill-popping epidemic. Some would say we are already there. It may explain, at least in part, the rise of benzodiazepines. By extension, it adds insight into patients who are legitimately prescribed pain relievers and are then unable to give them up. Antidepressants and ADHD medications are another set of prescriptions that have seen a marked increase in recent years. As a means of helping children and teens who suffer from issues, these drugs offer some relief, although medical experts are still studying the effects. Though the majority of children treated report a lessening of symptoms, a few critics argue against the use of antidepressants and ADHD medications because they alter the way brains works. Parents, along with some medical professionals, who have seen real changes in their children explain how these drugs help kids who would otherwise be lost in public schools. Antidepressants, however, now come with black-box warnings, indicating risk of increased suicidal ideation in children and young adults. For some, though, it is too little, too late. It is worth noting that many ADHD medications are stimulants – amphetamines and methylphenidate to be exact. The first is chemically similar to “Speed,” while the second is not much farther removed in effect. Benzodiazepine prescriptions have increased among young adults as well. While these drugs create a hyper-reaction in normal users, they calm down children who suffer from ADHD. Unfortunately, that hyper-reaction makes the drugs a target for drug dealers. Studies have shown that prescription medications are now second only to marijuana in use among 12- to 17-year-olds. Many of these young users report a belief that the use of the drug is safe since it was prescribed by a doctor. When children see parents taking similar drugs, it increases the misperception that these substances are safe. Teens who experience relief from such medications will likely have little compunction about offering it to friends – often resulting in dangerous consequences. The National Institute on Drug Abuse reports that 20 percent of teenagers have tried prescription drugs that were not intended for them. Yet, the CDC reports that doctors continue to prescribe psychiatric medications to school-aged children at astounding rates. There is a rising concern that the high rate of prescription drug distribution is financially or politically motivated. This fear stems from the hundreds of millions of dollars that large pharmaceutical companies spend every year on marketing – to both the public and medical professionals. In some cases, doctors are retained to aid in the development of new drugs. This does involve an exchange of money, but is legally appropriate behavior. At the other end of the spectrum is bribery. As you can see, the line between a physician’s paid advice and a physician being bought by a drug company isn’t always clear. Ties between medical professionals and drug companies are undeniable. Such practices gave rise to the Physician Payments Sunshine Act in 2013. This act requires drug and medical device companies to disclose any payment of more than $10 to any medical professional. Patients now have the ability to check up on doctors to see who has been reimbursed financially by the pharmaceutical industry. Not all doctors are over-prescribing medications, of course. In fact, studies indicate about 20 percent of medical professionals prescribe 80 percent of legal painkillers. Similarly, the vast majority of doctors are not taking inappropriate payoffs. However, this does not negate the impact of those who are. With an increased focus on doctors and pharmaceutical companies’ role in drug abuse and death, patients are beginning to take action. The CDC has responded by creating new guidelines for prescribers, including discouraging physicians from prescribing opioid pain relievers for long-term care. When opioids are used in short-term cases, providers are encouraged to start with the lowest dose. They are also instructed to begin with immediate-release, rather than extended-release, products. With these new guidelines comes better accountability. With such alarming distribution and overdose numbers, it is little surprise that those who over-prescribe certain medications face legal ramifications. Early in 2016, a Los Angeles-area doctor was convicted of second degree murder and sentenced to 30 years in prison following allegations that her prescription methods caused the fatal overdoses of three patients. This is the first time a doctor has been convicted on such charges in the United States. The hope among supporters of such penalties is to deter providers from inappropriately prescribing medications. Others fear that the push is too strong and doctors will be afraid of even legitimate prescribing writing, and that patients will be scared to take anything. Hopefully, rather than either of these situations, education will prevail: Doctors will be cautious with prescriptions, and patients will be more aware of the strength and risks of their medications. People who are suffering from pain and addiction need our help and compassion. Proper education regarding the dangers of prescription medication addiction may stop some of the cycle of prescription drug abuse, as will physicians taking a more proactive role in helping patients – without over-prescribing opioids. Unfortunately, the biggest abusers of the system, pharmaceutical companies, are a much more difficult problem to solve. After some pushback from consumers and legislators, hopefully, they too will work toward a solution before the prescription epidemic grows even larger. PreviousPrevious post:Impure Cocaine, Heroin, Meth And More: The Dangers Of An Adulterated Drug SupplyNextNext post:Could Wearable Biosensors Become Part Of Drug Rehab Programs?